The EU is backing a road-building project as part of its programme to stem migration from Africa into Europe. But it says it will carefully monitor the work to make sure that people are "adequately" paid and treated well. 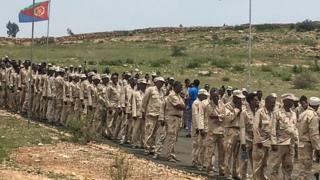 National service recruits will be used and the Foundation Human Rights for Eritreans (FHRE) says conscripts are "trapped for an indefinite period". FHRE has threatened to sue the EU over violating its human rights charter. FHRE director Mulueberhan Temelso has called Eritrea an "open-air prison [where] every person in national service is trapped in extremely harsh conditions". What's the issue with national service in Eritrea? Officially, Eritrea requires people to undertake 18 months of national service, but this period was extended indefinitely in the wake of the Ethiopia-Eritrea war that ended in 2000. A 2016 UN human rights investigation said conscripts were used as "forced labour". The "widely-criticised practice... has robbed the country's youth of their dreams creating a generation of Eritrean refugees", rights group Amnesty International said in 2018. Eritrea has said that this is a distorted picture of what is going on and has denied that there is indefinite national service. The government has not commented on what the FHRE is saying. There was hope that it would return to its original 18-month period following the signing of a peace deal with Ethiopia last year, but this has not yet happened. The EU has pledged to spend €20m ($22m; £17m) in Eritrea as part of its Emergency Trust Fund for Africa, which is aimed at tackling what the EU calls "irregular migration" by funding job creation schemes in various African countries. The money will be spent on improving the road network in Eritrea. In its explanation of the project, the EU acknowledges that people on national service will be used but it says they will be paid and the pay rates have recently been increased. It adds that the issue is the subject of "heightened dialogue" with Eritrea. "The EU does not support indefinite national service in Eritrea. Human rights are at the core of all our policies and it is misleading to suggest we are supporting forced labour," an EU spokesman said in an emailed statement to the BBC. Sources in Eritrea have told the BBC that since 2016 soldiers have nominally received $120 a month, but after deductions, including paying for rations, they personally get paid just $17 a month and their family gets $40. There has been no recent pay increase, the BBC understands. What will the rights activists do? FHRE has sent a letter to the EU warning that it will take the organisation to court for violating its own Charter of Fundamental Rights if it does not withdraw from the road-building project. The charter states that "no-one shall be required to perform forced or compulsory labour". "I'm very interested to hear what the EU has to say for itself because whatever you say it will amount to a defence of using forced labour," the lawyer acting on behalf of the FHRE told the BBC's Focus on Africa programme. "I find it hard to understand, and I'm hoping a lot of people within the EU will find it hard to understand," he added. Can Ethiopia's Abiy Ahmed make peace with 'Africa's North Korea'?